Diamonds can be subject to a variety of treatments, which are used in the attempt to improve either the colour or clarity of the stone. 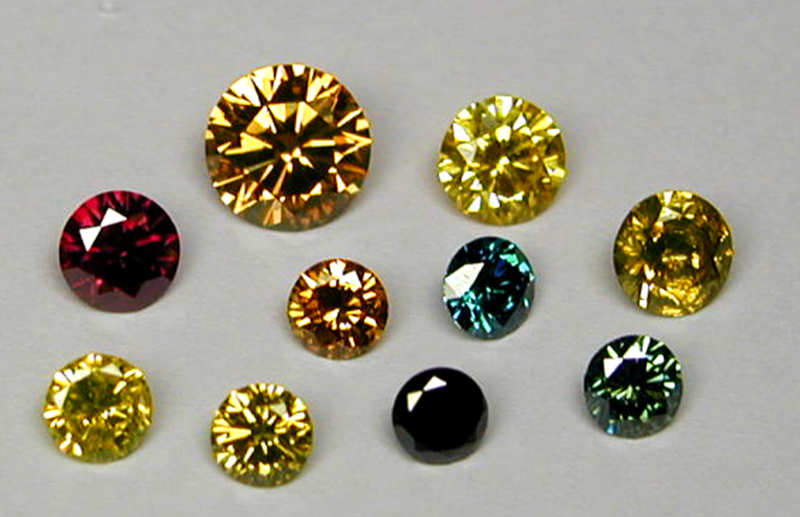 Diamonds can also be treated so as to produce fancy colours. Some diamond treatments are stable, whilst others are unstable and therefore the stone may be subject to change over time. The treatments seen in diamond can vary from quite basic treatments, to advanced treatments that have required multiple steps and processes. All diamond treatments are disclosed by GSL when observed in a stone. Laser drilling is used to make the appearance of dark coloured inclusions less obvious. A laser drills into the diamond and intense heat vapourises the inclusion, or an acid is used under special conditions to etch away the inclusion. The treatment leaves a very fine drill hole, and where acid is used, the results is a white inclusion which is the same shape and size as before but without the dark colour of the original inclusion. Laser drilling is a stable treatment which won't change over time or if subjected to heat, but should be disclosed at point of sale. Laser drilling can be picked up by the use of the handlens or microscope, where the drill hole and the laser channel can be detected. A more recent variation of the normal laser treatment focuses a laser beam onto an internal inclusion near the diamond's surface producing a fracture that travels from the inclusion to the surface creating the opening for the bleaching agents. In this treatment method (called KM laser treatment) there is no tell-tale drill tube. Fracture filling involves the use of a high refractive index glass, which is used to fill surface reaching fractures so as to minimise the appearance of the fracture. 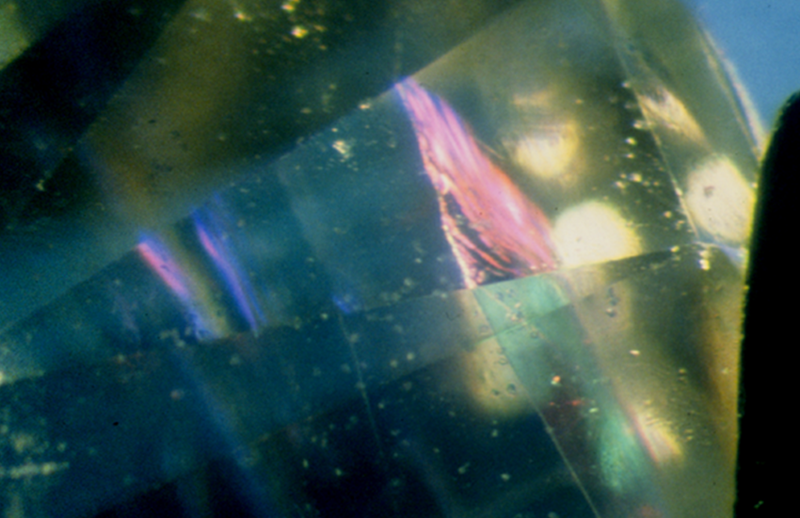 Fracture filling can be identified using the microscope by the "flash effect" of dispersed colours seen under dark field lighting. Fracture filling is not a stable treatment, and MUST be disclosed at point of sale. The glass filling is susceptible to heat and can perspire out of a fracture or sometimes change colour if the diamond is heated when jewellery is repaired. For this reason, stones that have been fracture filled cannot be issued a colour or clarity grade because the appearance of the stone changes dramatically when the diamond is first treated and the changes in the diamond are not permanent. GSL will not issue Diamond Gradding Reports for such stones but will instead issue a Gemmological Report describing the treatment. HPHT involves the application of extremely high pressures and temperatures to a rough or polished diamond, resulting in a change of colour. 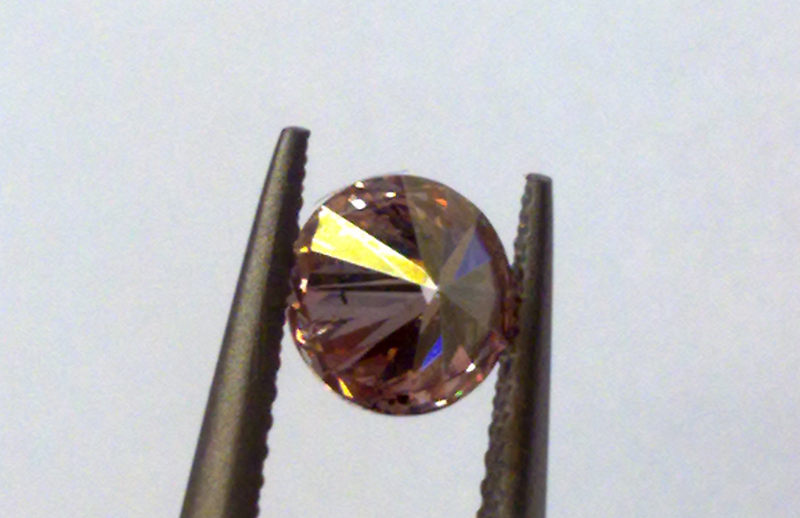 HPHT treatment can transform brown type II diamonds to near colourless or colourless, and rarely can result in pink or blue diamonds from type II stones. Type I brownish coloured stones can be transformed to fancy yellow or fancy greenish yellow. 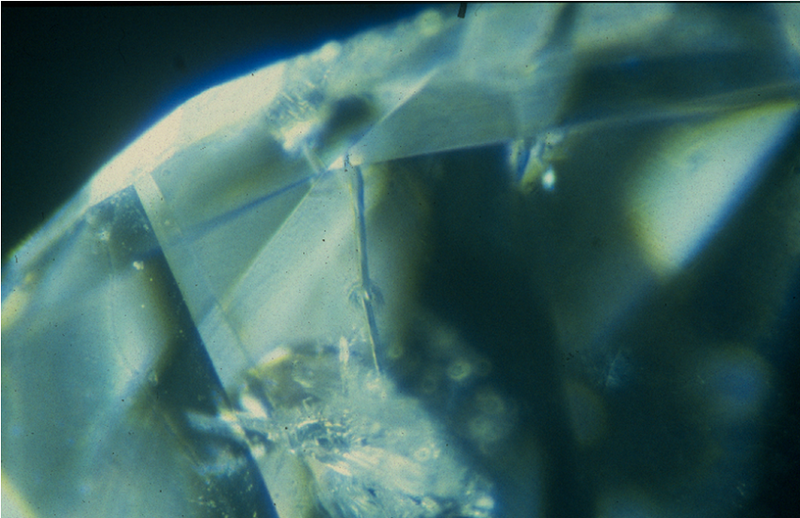 HPHT treatment of type II diamonds can be identified using Raman, while UV-Vis and other spectrometric analyses are used to identify HPHT treated type I stones. Irradiation of diamonds involves the use of high energy particles to change the crystal lattice of a diamond. 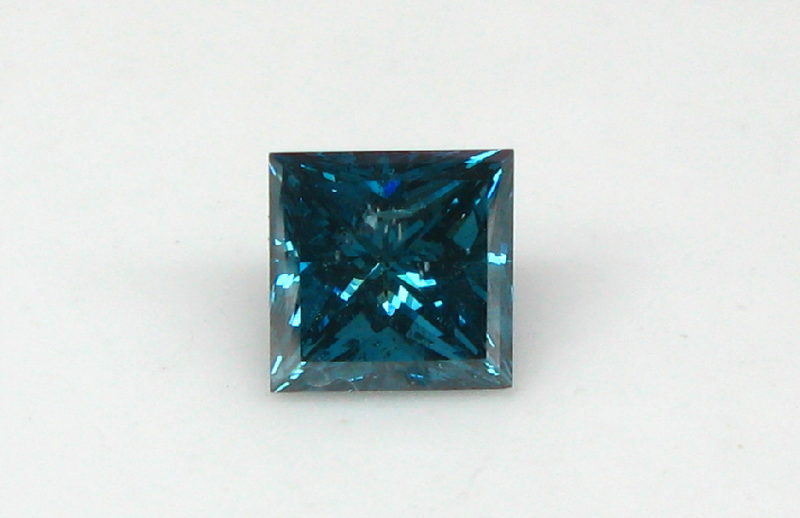 The alteration in the crystal lattice results in a change of colour in the diamond. The colours produced by irradiation vary due to the colour of the starting material and the method of irradiation used. 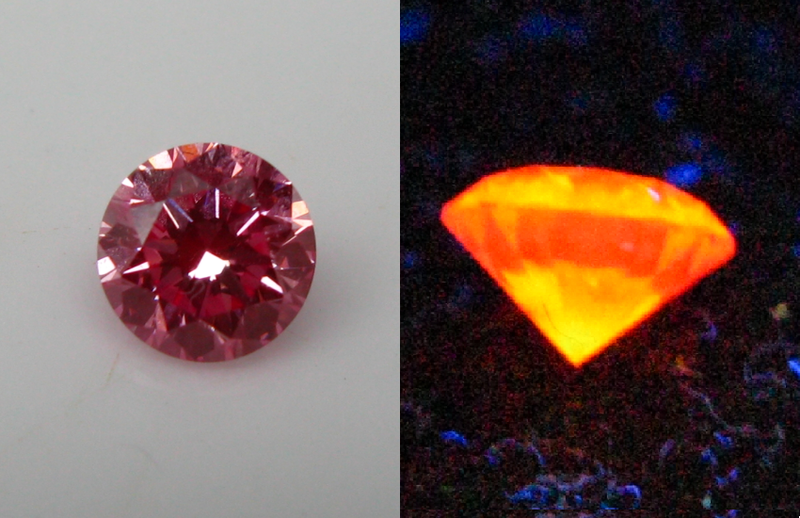 After irradiation, diamonds can also be heated under special conditions (called annealing) to further change their colour to a number of attractive fancy colours. Natural or man-made diamonds can be treated using a combination of methods to create a very intense and deep purplish pink colour that is very similar to the very rare and expensive Fancy Vivid Purplish Pink natural diamonds that are mined at the Argyle Mine in Western Australia. In some cases a deep red colour can also be produced. This three step treatment involves HPHT, then irradiation then annealing. Proof of this treatment requires Raman and UV-Vis spectrometry but a reliable first indication of this treatment is the unusual fluorescence of these treated stones when exposed to Ultra Violet light. Surface coating involves the deposition of a coloured material in a thin layer over the surface of the stone. The coating therefore results in a change in colour of the stone. Surface coating must be disclosed at point of sale. Coating is not a stable treatment, as over time the coating wears away or is scratched off. Surface coating is identified using the microscope, which can be used to observe worn or scratched areas, or areas where the coating has flaked off. Coated stones are very sensitive to heat and abrasive agent such as some cleaning solutions and plating solutions used to give jewellery the finishing touches.